Prosecutor General of Ukraine Yuriy Lutsenko has announced that the person who ordered the contract hit of former Russian State Duma member Denis Voronenkov in Kyiv was Russian FSB-controlled criminal leader Vladimir Tiurin, according to an UNIAN correspondent. "We are convinced that the assassination of Denis Voronenkov is connected with his testimony about the presence of Russian troops in Ukrainian territory, as well as those in Viktor Yanukovych's high treason case, confirmed by him as a witness of the event in the Duma of the Russian Federation. To prevent Voronenkov's testimony in Ukrainian and international courts, members of the Russian special services developed a plan for his physical elimination as a witness. The actual person who ordered the contract hit, according to the Main Intelligence Directorate of the Ministry of Defense of Ukraine, confirmed by the investigation of the Kyiv prosecutor's office, was a FSB-controlled crime lord Vladimir Anatolievich Tiurin," Lutsenko said at a briefing in Kyiv on Monday. In addition, according to the investigation, the contractor had a personal motive. Read alsoKyiv court arrests accomplice to murder of Voronenkov for two months, without bail"Besides, the contractor had a personal motive for murder. Eight years ago, he was a boyfriend of Maria Maksakova, who [later married to Voronenkov and] was Voronenkov's wife at the time of the murder. Tiurin agreed to finance and organize the crime in exchange for benefits from Russian special services to control criminal groups in Russian territory and some CIS countries," the prosecutor general said. At the same time, according to Lutsenko, the murder was prepared together with the leadership of the Russian FSB. "According to the established version of the investigation, the FSB leadership along with the leaders of the Russian criminal world developed a plan to kill and remove an extremely valuable witness from their point of view," he said. Lutsenko stressed that the investigation had established all the participants in the group involved in the murder. "Based on the results of the large-scale investigation, it was possible to identify all the participants in the criminal group, including contractors, organizers and executors involved in this assassination. It was possible to restore the entire chronology of events from preparations for the crime to the detention of the suspects," he said. According to the investigation, Pavlo Parshov, who shot at Voronenkov, was in collusion with the citizens of Ukraine such as Vasylenko, Los, Levenets, and Tarasenko. "The investigation found that the crime was committed at about 11:30 local time on March 23, 2017, by a citizen of Ukraine, Pavlo Oleksandrovych Parshov, by prior conspiracy with citizens of Ukraine Vasylenko, Los, Levenets, and Tarasenko," Lutsenko said. At the same time, he said that two of the five had been detained. "Los and Tarasenko are in custody. Vasylenko and Levenets have been put on the wanted list outside Ukraine." 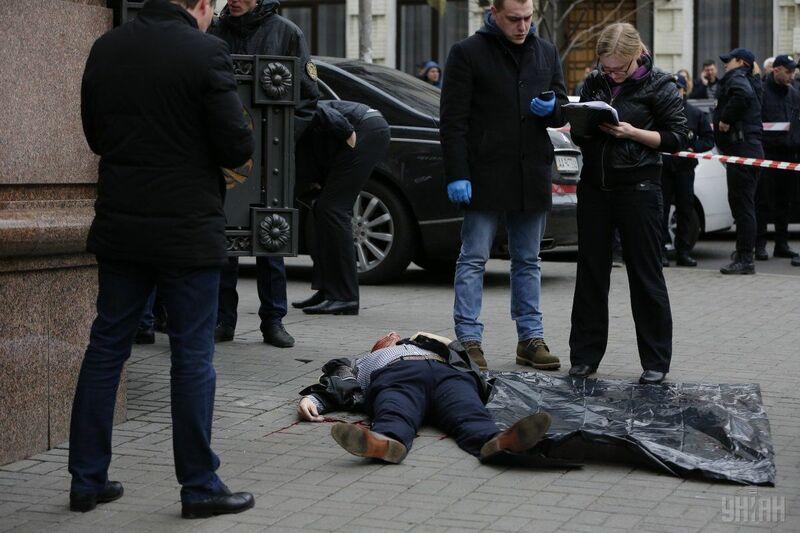 As UNIAN reported earlier, former State Duma member Denis Voronenkov, who was expected to become an important witness in a treason trial against Russian-backed ex-president of Ukraine Viktor Yanukovych, was shot dead in the center of Kyiv on March 23, 2017. Voronenkov's bodyguard, who was wounded in the attack, also managed to hit the assassin with several shots as he returned fire. The killer later died amid surgery in a Kyiv hospital. Anton Gerashchenko, an adviser to the Ukrainian interior minister, said that the killer, Pavlo Parshov, was born in Sevastopol, Crimea, in 1998. He was reportedly hired by the Russian special services. 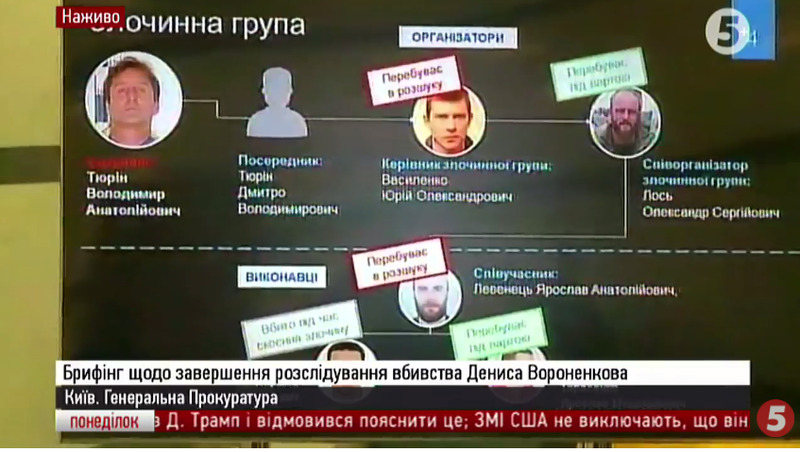 Later, the SBU Security Service of Ukraine said that they were vetting whether Parshov was a Russian FSB agent.